Theo Beckford, 20, of no fixed address, Farshad Ibrahimi, 24, of North Circular Road, Neasden, London, Lee Martin Jones, 54, of Chaucer Court, Guildford, Preeti Patel, 45, of Bridge Street, Guildford and Lucia Zaccarini, 23, of Armour Close, Islington, London appeared at Guildford Crown Court for sentencing on Friday, 12 April 2019. On Tuesday, 10 July 2018, CCTV operators witnessed a man, later identified as Theo Beckford, walking a dog near the Electric Theatre. He was seen to exchange a small white item with another man, who gave Beckford something in return. Immediately afterwards, Beckford repeated the exchange with another young man. Due to repeated sightings of drug deals a proactive intelligence operation was set up, focused on the address of Preeti Patel in Bridge Street, Guildford, which officers believed was being used as a base for drug dealing. Number plate recognition work shows that Jones travelled to North London on the morning of Wednesday, 3 October, before returning with Ibrahimi, Beckford and Zaccarini, who had been dropped off in London the previous day. Later that day, Beckford and Ibrahimi were seen walking towards the flat, accompanied by Jones and Zaccarini. The hired vehicle was parked nearby. Over the following weeks, covert officers witnessed further deals between the gang, including exchanges with vulnerable local homeless people. A warrant under Section 23 of the Misuse of Drugs Act was granted for Patel’s property, where officers located Beckford, Jones, Ibrahimi and Zaccarini. The four were arrested for conspiracy to supply Class A drugs. Patel was not at the location at the time of the warrant, but she too was arrested on suspicion of conspiracy to supply Class A drugs. On the kitchen worktop, officers found 145 wraps of crack cocaine and heroin, a pile of more than 300 white rocks, which tested positive as crack cocaine, and a lump of brown substance wrapped in cling film, which tested positive for heroin. Drug preparation materials including cling film, strips of black plastic and scales were also found. A mobile phone, on charge in the kitchen, had recently sent a message to 500 contacts suggesting drugs were available to purchase. More wraps were found scattered across the bed and windowsill of the bedroom, plus a number of other mobile phones which constantly rang while officers conducted the search. 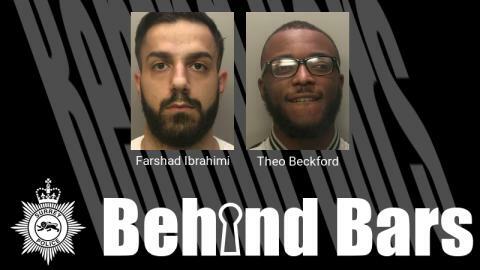 Beckford, Ibrahimi, Jones and Zaccarini and Patel were charged with being concerned in the supply of crack cocaine and heroin. Patel was further charged for permitting the use of premises for supply of crack cocaine and heroin. Investigating officer, PC Simon Laidlaw, said: “Drug dealing is a blight on our communities and we’re pleased four drug dealers are now off the streets. Our efforts to disrupt the supply of drugs in our county relies on information from both intelligence operations and members of the public coming forward with reports.